Here at Mount Eden, we are creatures of habit. Much like a bird knows when to migrate, our knowledge of our climate and soil have ingrained a well-practiced harvest dance. This all came screeching to halt when, during our drought, Mother Nature had her own harvest plans. 2013 and 2014 were very early harvests that had us scrambling. We got wise to the “new normal” and were ready to go when the Pinot harvest kicked off on August 5th in 2015. The hardest part of making Pinot Noir is growing and picking at the ideal moment. The grape is so ephemeral that any overripe or under-ripe qualities will show themselves as the bottles age. The signature of the 2015 is its freshness and lift. Poised boysenberry and earth tone flavors jump out on the palate. Buoyant acidity with a little tannin assist in giving a solid structure. This is easily a twenty-five-year wine with good cellaring. Brilliantly fresh and snappy black raspberry aromas lead into a savory streak of mulberry-laced pork fat, hickory and tobacco smoke, with a hint of crushed slate on this wine’s fascinating and shape-shifting nose. Peppery spice grips the palate immediately, then splashes fresh red plum and pomegranate flavors around, finishing on white pepper, cracked nutmeg and unrelenting tension. —M.K. 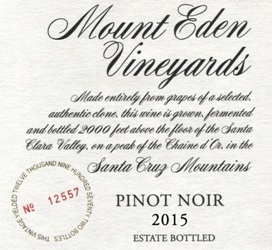 Seeing roughly one-third whole clusters and a mix of new and neutral oak, the 2015 Pinot Noir Estate is another terrific wine from this benchmark estate. Possessing a more structured, backward feel as well a deep powerful nose of black currants, charcoal, and scorched earth, this is a serious, age-worthy Pinot Noir that needs 3-4 years of bottle age yet will see its 20th birthday in fine form. The 2015 Pinot Noir offers notable depth and textural richness, but it is also very closed in on itself. The aromatics and fruit density are both hugely promising, but readers should plan on being patient with the 2015, as it needs time. Whole cluster inflections from the 35% stems add savoriness throughout. The 2015 is a fabulous wine in the making. Harvest began between August 8 and 10, which is shockingly early.